Male reproductive anomalies are widely distributed among mammals, and male factors are estimated to contribute to approximately 50% of cases of human infertility. The B10.M/Sgn (B10.M) mouse strain exhibits two adverse reproductive phenotypes: severe teratospermia and male subfertility. Although teratospermia is known to be heritable, the relationship between teratospermia and male subfertility has not been well characterized. The fertility of B10.M male mice is considerably lower (~ 30%) than that of standard laboratory mouse strains (~ 70%). To genetically analyze male subfertility, F2 males were produced by intercrossing the F1 progeny of female B10.M and male C3H/HeN mice. The fertility of each F2 male mouse was assessed based on the outcomes of matings with five females. Statistical analysis of correlations between the two reproductive phenotypes (teratospermia and subfertility) in F2 males (n = 177) revealed that teratospermia is not the cause of male subfertility. Quantitative trait loci (QTL) analysis of the male subfertility phenotype (n = 128) using GigaMUGA markers mapped one significant QTL peak to chromosome 4 at 62.9 centimorgans (cM) with a logarithm of odds score of 11.81 (P < 0.05). We named the QTL locus Mfsf1 (male factor subfertility 1). Further genetic analysis using recombinant males restricted the physical area to 1.53 megabasepairs (Mbp), encompassing 22 protein-coding genes. In addition, we found one significant QTL and one indicative QTL on chromosome 5 and 12, respectively, that interacted with the Mfsf1 locus. Our results demonstrate that genetic dissection of male subfertility in the B10.M strain is a useful model for characterizing the complex genetic mechanisms underlying reproduction and infertility. The online version of this article ( https://doi.org/10.1007/s00335-018-9773-4) contains supplementary material, which is available to authorized users. Human infertility is a common problem worldwide, and male factors are estimated to contribute to 50% of cases (Agarwal et al. 2015; Melodie and Christine 2018). The etiology of male infertility is highly variable and has been associated with endocrinological, immunological, neurogenic, and environmental factors (Iammarrone et al. 2003). A correlation between male infertility and emergence of cancer has also been reported (Nagirnaja et al. 2018). Although genetic contribution to male factor infertility are evident in humans, limited associations with chromosomal alterations, such as Yq microdeletions and Klinefelter’s syndrome, and mutations in specific genes, such as CFTR, have been reported (Neto et al. 2016). Studies in mice have identified 666 genes that cause male infertility when disrupted (Nagirnaja et al. 2018). As genomic information continues to accumulate, an increasing number of genetic variations linked to male infertility are expected to be identified, and the search for novel genetic variations that underlie male factor infertility is already underway (Miyamoto et al. 2017; Robay et al. 2018; Halder et al. 2017). Subfertility is defined as reproductive efficiency that lies between that of infertility and normal reproductive performance. This low efficiency is a major concern in agriculture and animal production. For example, in dairy cows, a trend of declining fertility persists for several decades (LeBlanc 2010). Substantial attention has been paid to understand the correlation between milk production and cow fertility (Jamuna and Chakravarty 2016; Berry et al. 2016). With the advent of newly developed technologies in genome science, application of genomic information to improve fertility has become a promising mechanism to improve unfavorable reproductive conditions (Taylor et al. 2018). Use of model mouse strains to characterize fertility is advantageous because the effects of genetic background can be assessed in a reproducible manner. For example, the well-characterized B10.M/Sgn mouse strain is characterized by male subfertility and severe teratospermia, with ~ 60% of sperm exhibiting abnormal morphology (Gotoh 2010). Previously, we reported that the teratospermia phenotype is heritable (Gotoh et al. 2012) and mapped two of the loci responsible: Shm1 on chromosome 1 and Shm2 on chromosome 4. Interactions between these two loci were evident. Homozygosity of the Shm1B10.M allele was required to express teratospermia, and the enhancing effects of the Shm2B10.M/B10.M genotype were observed only when the genotype of the animal was homozygous for the Shm1B10.M allele. However, whether a link exists between the teratospermia phenotype and male subfertility in this mouse strain has not previously been investigated. Therefore, in the present study, we performed genetic analyses on the male subfertility phenotype and explored linkage with the teratospermia phenotype. All experiments were approved by the Institutional Animal Care and Use Committee of the Institute of Agrobiological Sciences. Animals were housed and cared for according to guidelines established by the Committee. C3H/HeNCrlCrlj (C3H) mice were purchased from Charles River Japan (Yokohama, Japan). C57BL/10J (B10) mice were purchased from S. L. C. (Hamamatsu, Japan). B10.M/Sgn (B10.M) mice are maintained at our facility. Animals were maintained on a cycle of 12 h of light and 12 h of darkness under specific-pathogen-free conditions. The commercial mouse diet CRF-1 (Charles River Japan, Yokohama, Japan) and water were provided. F2 animals were produced by intercrossing F1 animals obtained from crossing B10.M females with C3H males. Recombinant F2 males in which recombination occurred between the D4Mit251, D4Mit54, and D4Mit170 microsatellite markers were selected for fine mapping of the locus responsible for the male subfertility phenotype detected by QTL analysis. Mature, virgin, C3H females ages 8–12 weeks were used for the assay. Five female mice were mated with each male mouse. Male fertility is assessed according to a standard methodology for reproductive toxicological assay (Teramoto et al. 1980; Mitchard et al. 2012). Two weeks after the vaginal plug was observed, the female mice were dissected. The numbers of corpus luteum (yellow body) on ovaries and the numbers of embryos in uterus were counted under a stereo microscope (SMZ25; Nikon, Tokyo). Because yellow body is the remains of ovarian follicle that has released a mature ovum during a previous ovulation, the ratio of the total number of embryos to the number of yellow bodies was used to estimate the fertility percentage for each mating. The fertility of each male mouse was expressed as the mean fertility percentage for the five matings. Sperm samples were collected from 3- to 5-month-old male mice after fertility testing was completed. Sperm morphology was analyzed as described earlier (Gotoh 2010). Two independent samples, each containing a minimum of 200 sperm cells, were analyzed under 400 × magnification using a differential interference contrast microscope (DMRXA2; Leica Microsystems; Cambridge, UK). Genomic DNA samples were prepared from mouse tail snips (~ 5 mm) as previously described (Hirawatari et al. 2015b). Samples from 128 F2 animals were genotyped using GigaMUGA markers (Morgan et al. 2015) at the Genetics Laboratory, University of North Carolina, Chapel Hill. QTL analysis was performed using R/qtl software (Broman et al. 2003; Broman and Sen 2009). The scanone function was used for single QTL analysis, and the scaonetwo function was used to detect epistatic interactions between two loci. The threshold for each assay was determined by permutation tests (n = 1000). P values less than 0.05 and 0.37 were considered statistically significant and suggestive, respectively, for QTL analyses. Information of position, MGI ID, feature type, and symbol of genes is referred to the Mouse Genome Informatics (MGI) website (http://www.informatics.jax.org/marker). Information of known reproductive phenotype of genes is referred to the International Mouse Phenotyping Consortium (IMPC) website (http://www.mouse.phenotype.org). Information of expression of genes in testis is referred to the Expression Atlas database of the European Bioinformatics Institute website (http://www.ebi.ac.uk/gxa.home). Information of single nucleotide polymorphism (SNP) of genes among C3H/He, C3H/HeJ, C57BL/10J, C57BL/6, and C57BL6J inbred strains is referred to the SNP database of the MGI website (http://www.informatics.jax.org/snp). All information was updated on July 31, 2018. Correlations between male subfertility and teratospermia phenotypes were analyzed using Spearman’s rank correlation test. Comparisons between groups were analyzed by one-way analysis of the variance (ANOVA) using SPSS 16.0 for Windows (Analytical Software; Chicago, IL, USA). Figure 1a shows a representative example of the ovaries and a uterus from a C3H female mated with a sub-fertile F2 male. In this case, nine yellow bodies and two embryos were present, resulting in a fertility estimate of 22%. Figure 1b presents an example of a sperm spread from an F2 male exhibiting severe teratospermia (64% abnormal spermatozoa) with a number of morphological abnormalities. The correlation between male fertility and sperm morphological abnormalities in F2 males is shown in Fig. 2. The horizontal dotted line at 58.7% represents the statistical mean fertility minus the standard deviation (SD) for B10 males (n = 10). The vertical-dotted line at 9.9% represents the statistical mean percentage of sperm shape abnormalities plus the SD for B10 males (n = 10). These lines define approximate boundaries between high and low values for each phenotype. A considerable number of individuals are found in both the upper-right square and the lower-left quadrants. Males plotted in the upper-right quadrant exhibit normal fertility with teratospermia. Males plotted in the lower-left quadrant exhibit subfertility with normal sperm morphology. Statistical analysis of F2 males (n = 177) confirmed the lack of a correlation between the two phenotypes (P > 0.05). The scanone function of the R/qtl package revealed one significant QTL peak on chromosome 4 at 62.94 cM with an LOD score of 11.81 (Fig. 3a). We tentatively named this locus male factor subfertility 1 (Mfsf1). These results confirmed that male subfertility is heritable in the B10.M strain. The marker nearest the QTL peak is UNC8352858. The effects of the UNC8352858 genotype on male fertility are shown in Fig. 3b. Chromosome interval mapping using the R/qtl package estimated that the Mfsf1 locus mapped between the UNCHS013009 (59.84 cM) and UNCHS013136 (63.47 cM) markers (P < 0.05). Genetic mapping of the Mfsf1 locus was performed using conventional microsatellite markers and recombinant males to narrow the mapping region obtained by QTL analysis. QTL results indicated that homozygosity of the Mfsf1B10.M allele was required to express the subfertility phenotype, although the fertility values of the Mfsf1B10.M/B10.M homozygotes varied widely (Fig. 3b). Three informative recombinant males were obtained. The Mfsf1 locus was mapped between the D4Mit251 and D4Mit170 markers by this analysis (Fig. 4a). Together with QTL mapping results, these results indicate that the Mfsf1 locus is restricted to a 1.53 Mbp region containing 22 protein-coding genes (Fig. 4b). Known information of candidate genes within the mapped interval is listed in Supplemental Table S1. The wide distribution of fertility in Mfsf1B10.M/B10.M homozygotes could not be explained by Mfsf1 genotype alone. No significant QTL peaks showing additive effects were found. Therefore, we next searched for other factors that could interact with the Mfsf1 locus using the scantwo function of the R/qtl package. One significant interacting QTL peak was found on chromosome 5 at 40.13 cM; this locus had a suppressive effect on fertility (Fig. 5a). In addition, one QTL peak with an enhancing effect on fertility was found on chromosome 12 at 20.89 cM. The LOD score for this single QTL peak (2.72) was slightly below the suggestive level (Fig. 5b). No significant interaction of this factor with the Mfsf1 locus was found. This study revealed that male subfertility in the B10.M mouse strain is heritable. The Mfsf1 locus responsible for subfertility is mapped to chromosome 4. It is different from the major locus (Shm1) responsible for teratospermia on chromosome 1 (Hirawatari et al. 2015b). We also found that the subfertility phenotype was not associated with the previously reported sperm shape abnormality phenotype in B10.M strain. Similarly, analysis of the TEN1 mouse strain also reported that teratospermia was not associated with male subfertility (Hirawatari et al. 2015a). Male subfertility is often attributed to teratospermia. The results of this study clearly show that sperm shape abnormality phenotype and male subfertility phenotype are not always linked. Although male subfertility and teratospermia are not associated in B10.M mice, this does not necessarily imply that there is no association between the genes responsible for these two phenotypes. With respect to the teratospermia phenotype in B10.M mice, the two loci responsible, Shm1 on chromosome 1 and Shm2 on chromosome 4, have been shown to interact (Gotoh et al. 2012). Homozygosity of the Shm1B10.M allele is required for expression of the sperm shape phenotype, and the Shm2B10.M allele enhances the frequency of morphologically abnormal sperm in a recessive manner. The Shm2B10.M allele alone does not cause teratospermia. The Shm2 locus has been mapped to chromosome 4 between the D4Mit148 (69.48 cM, 137148689 bp) and D4Mit170 (70.47 cM, 138615338 bp) markers. Thus, the two mapped regions, the Shm2 locus in the teratospermia study and the Mfsf1 locus in this study, are nearly identical, and the genes encoded by the Shm2 locus and the Mfsf1 locus could possibly be identical. Only 22 protein-coding genes are located within the restricted mapped area (Supplemental Table S1). Because the B10.M strain is an h2-congenic strain possessing the h2-complex on chromosome 17 in a genetic background derived 75% from C57BL/6 (B6) and 25% from B10 strains (Gotoh 2010), genes on chromosome 4 have originated from either B6 or B10. By searching SNP database, several non-synonymous SNP variants between C57BL/6J and C3H/HeJ strains are found within the coding sequences of the candidate genes (Supplemental Table S2). SNP information of B10 strain for these genes is not available. Because neither B10 males nor C3H males show subfertile phenotype (Hirawatari et al. 2015b), the listed SNP variation is unlikely to cause subfertility of B10.M. A novel mutation appears to have emerged during or after establishment of the B10.M inbred strain. With recent advances in technology, whole genome DNA sequencing is now available for mouse, and genome editing technology has become convenient. These techniques will be required to find genetic variations within the mapped region and then show that the subfertility phenotype can be induced by the identified mutation. Epistasis, or interaction between genes, was observed in this study. Homozygosity of the Mfsf1B10.M allele appears to be required to express male subfertility in the B10.M strain, as the other two genotypes, heterozygotes and wild-type homozygotes, exhibit normal fertility. However, less than half of the Mfsf1B10.M/B10.M homozygous males displayed the subfertility phenotype (Fig. 3b). The QTL analysis in this study indicated two bidirectional factors present on chromosomes 5 and 12 that interacted with the Mfsf1 locus. The locus on chromosome 12 was the only factor found to enhance fertility. Likely due to the limited sample size in this study, the interacting effect of the QTL on chromosome 12 was not statistically significant. Results from this study demonstrate that genetic approaches can be a powerful tool to analyze mechanisms underlying the complexity of the reproductive system. These approaches are useful as a large number of the 3000 genes expressed in male germ cells may contribute to male infertility (Schultz et al. 2003). In fact, gene knockout studies in mice have already identified 666 genes associated with male infertility (Nagirnaja et al. 2018). In addition, genetic interactions associated with reproductive phenotypes are common. Over the course of evolutionary history, each mammalian species or subspecies has acquired complex mechanisms to regulate normal reproduction. Haldane’s rule in mammals (Coyne 1985) and the hybrid sterility observed between two Mus musculus (house mouse) subspecies (Storchova et al. 2004) are two examples of these types of regulatory mechanisms. Another is typified by the frequent appearance of infertile animals among the hybrid descendants of two reproductively normal, inbred mouse strains (Nishimura et al. 1995; Shorter et al. 2017). 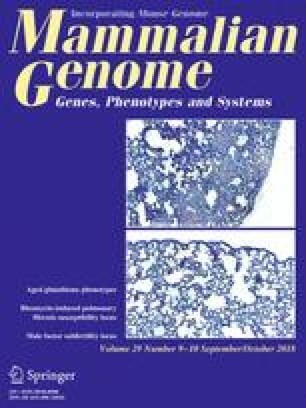 However, reproductive regulatory mechanisms are not only defined by the extreme condition of infertility, as a wide variety of male reproductive phenotypes has been observed among F2 hybrid males produced by reproductively normal B6 and C3H strains in the absence of a novel mutation (Gotoh and Aoyama 2012). In the genetic study of teratospermia in the TEN1 mouse strain, at least three interacting loci, Shm3 on chromosome 1, Shm4 on X chromosome, and Shm5 on chromosome 6, have been identified (Hirawatari et al. 2015b). In cases in which a single genetic variation causes infertility, genomic methods can be powerful tools for finding the causative gene. However, male reproductive system is supposed to be composed of multiple interactions of genes. The authors would like to thank Mr. Heiichi Uchiyama for his assistance with the experiments. We also thank BioMed Proofreading® LLC for proofreading of the manuscript. This work was supported by the Ministry of Agriculture, Forestry, and Fisheries, Japan.